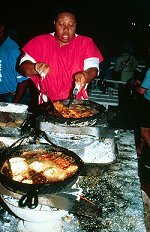 Barbados Festivals: Oistins Fish Festival! Held at the historic town of Oistins on the south coast of Barbados, the Oistins Fish Festival celebrates the contribution made to Barbados by those persons involved in the local fishing industry. The festival is a unique attraction that offers fun and entertainment for both locals and visitors alike. Music, crafts, food and fun! Enjoy the sweet strains of calypso and reggae music coming from the sidewalk stalls. Of course dancing to all that music builds up an appetite, so head for the food and beverage stalls and enjoy traditional Bajan fare such as fish cakes, fried fish and pudding and souse, all washed down with a cool Banks Beer. Local arts and crafts can also be found in abundance as talented craftsmen take the opportunity to display their wares. Entertaining, the Oistins Fish Festival certainly is! The fish boning competition is a huge attraction for both locals and visitors as is the grease-pole competition! The focus of the festival however is really on honouring those who contribute to the fishing industry in Barbados. A time to remember those who feed us from the seas surrounding this beautiful island. Read about "Fishing... a way of life!" Join the Experience Coastal Oistins tour to savour delicious local cuisine and soak up the exciting atmosphere of Oistins.